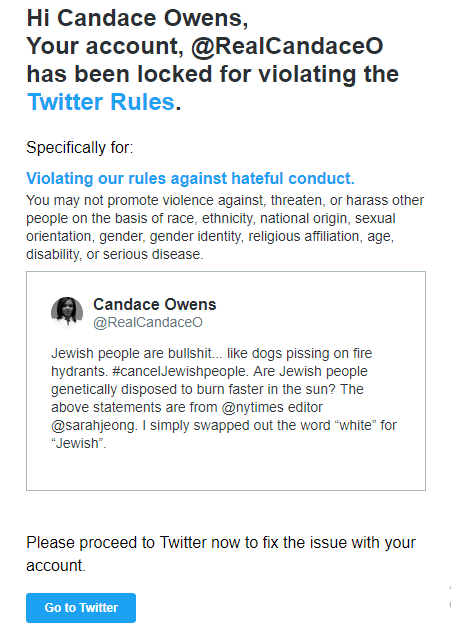 Twitter censors just suspended the account of Turning Point USA communications director Candace Owens after she mimicked, in her own tweets, racist posts that were put out by Sarah Jeong — who was protected and defended by Twitter. Truly, is there any doubt left that social media not only leans left, but also censors the right? This isn’t just hypocrisy. This is Gestapo-like. Twitter slapped Turning Point USA Communications Director Candace Owens with a temporary suspension after she highlighted racist posts made by Sarah Jeong, the recent New York Times hire whose long history of bigoted tweets about white people has placed the newspaper at the center of a public outcry. The beleaguered platform then reversed the ban, calling it an “error” in an email to Owens. Owens’ tweets mimicked the wording of Jeong’s, with one important difference: Owens substituted the words “Jewish people” for “white people,” in an attempt to show that some forms of racism are considered more acceptable than others. Donald Trump Jr. made a similar point in an exclusive interview with Breitbart News this weekend, when he said “people would be losing their minds” if Jeong had made her bigoted comments about black people or Hispanics. Twitter, already under fire from Republicans (including the president) over political bias, now appears to have proven her point. Even though Jeong made the following tweets, she has not been suspended, and the tweets remain undeleted. Owens even clarified in the tweet itself that she was repeating Jeong’s statements, not making original statements of her own. Twitter still banned her. After word of the suspension began to go viral on social media, Twitter reversed itself and reinstated Owens’ account. Twitter claims the suspension was an “error,” which seems to be their standard response when conservatives are suspended, shadowbanned, or do not show up in searches, as was the case with Rep. Matt Gaetz.